Meriem Bennani, the New York-based artist who was recently featured in the New York Times, is one of the artists selected by Riffy Ahmed and Sarah El Hamed for the ARA-B-LESS? project at the Saatchi Gallery, part of The Nour Festival of Arts. I spoke with Riffy to learn more about the project. How did you conceive the title ARA-B-LESS ? 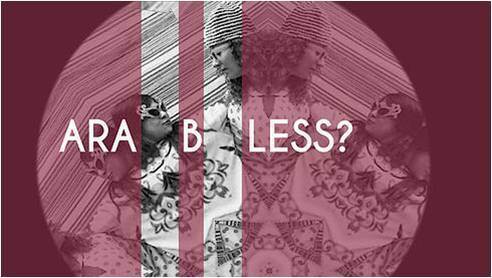 The project title ‘ARA-B-LESS ?’ is a neologism born of a play on the word ‘Arabness’ (Arabism). Two designs hint at the meaning behind “ARA-B-LESS ?” – the first emphasising ‘BLESS’ suggests that Arab identity is a blessing, while the second emphasises “LESS’, the ways in which what it means to be Arab have evolved over time, perhaps losing something along the way. ‘ARA-B-LESS?’, as a question, also focuses on whether we, the artists, consider ourselves to be more or less Arab for having been born and brought up in the West, albeit by parents from Arab countries.